One of the most popular things for people to do when they get a new PC is to get rid of the PC manufacture's, or Microsoft's desktop background. If you're a heavy desktop user, in other words your desktop is always crowded with icons, you might want to change to a solid color background. An image on your desktop background might make it too busy to easily locate icons. If you're not a heavy desktop user, in other words you usually use the Start menu to access documents and applications, then you might want to change to a different desktop background image. Windows provides dozens of beautiful images that you can select as replacement for your current image. Or you can choose an image that you found on the Internet or shot with your own digital camera. If you want to use an image from the Internet or your own image, place the image somewhere you can locate it easily, like in your Pictures Library folder. • You can use an image in the .bmp, .gif, .jpg, .jpg, or .png file format. 1. right-click on a blank area of the desktop and, in the popup menu that appears, choose Personalize. 2. In the "Change the Visuals and Sounds on Your Computer" window that appears, click on "Desktop Background" (near the bottom of the window). 3. On the "Choose your desktop background" screen, choose from the drop-down list: Windows Desktop Backgrounds, Pictures Library, or Solid Colors. 4. If you choose Solid Colors, click on a solid colored square in the list. 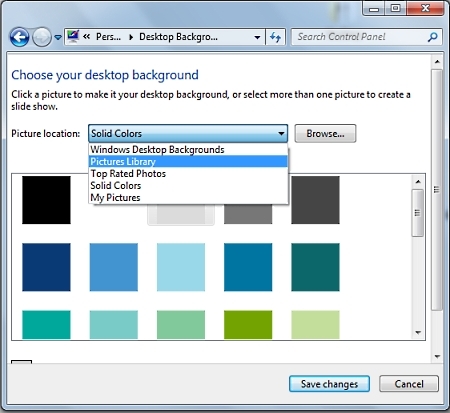 If you choose Windows Desktop Backgrounds or Pictures Library, click on an image in the list. You can also click on the [Browse...] button and select an image from anywhere on your PC. If you choose an image, the image may not be exactly same dimensions as your computer's screen. In that case, you'll have to choose a method for Windows to display the image form the Picture position: drop-down list. Fill - Resizes the image to fill the entire screen without changing the image's aspect ratio. This may cause part of the image to lie outside the visual area.